Job mourns the absence of God. MV073 / LBW320 / ELW632 / GC(II)570 / G(3)668 O God Why Are You Silent? (Marty Haugen) Excellent seeking words expressing grief and fear and the absence of God. Sung to the familiar PASSION CHORALE. Lyrics. Sheet music sample. New words to old tunes. Iona (HSNW) / GA433 / URW233 How long, O Lord, will you quite forget me? (John Bell) A plaintive bluesy song, which could be sung by the congregation, but they may prefer to listen to it as a reflection. The third verse requires a bit of trickiness to fit the syllables in. Lyrics. Online Resource / Tune In / ATAR663 Save us in the time of trial (Shawn Whelan) Reflective chant-like chorus and verses. Free downloadable songbook, lyrics and sound samples. TiS 690 / CH259 / StS115 / SP237 Beauty for brokenness hope for despair (Graham Kendrick) Themes of healing from personal and universal suffering and an emotive chorus. “Refuge from cruel wars, havens from fear, cities for sanctuary, freedoms to share, peace to the killing-fields, scorched earth to green; Christ for the bitterness, his cross for the pain”. Lyrics. Taizé / A&M847 / GtG294 / G(II)456 / GC644 / PfAS088A / SP330 Within Our Darkest Night (Jacques Berthier) A lovely chant of continuing hope in the face of despair. Lyrics and sound samples. Good for kids. AoV2-054 / Iona (T1AU, LFB) / MV077 / GtG414 / SFFS 2057 / G(II)438 / GC618 / RS 736 / SP&P111 / PfAS046D / URW409 / Lau909 / StF019 Be still and know that I am God (John Bell / Graham Maule) I love this song. If you wish to focus on the positive for this reading, this simple chant is beautiful. Works as a round or in unison. Sheet music sample. Good for kids. ATOK 311 / CH754 / GA401 Be still and know that I am God and there is none beside me (John Bell) A good alternative to the above song. I like the 2nd verse especially "I am the one who calls you my friends, and there is none beside me". CH doesn't have the 2nd verse. Sound sample. Good for kids. ATN 9 / NCH743 / CH755 / W&R450 / Srce68 / StF018 / MP048 Be Still and Know (Anon) This is the old classic. Sources vary in the verses they have and the level of inclusiveness in the lyrics. Lyrics & chords. *CH537 / AA147 / A&M572 / SP256 / StF717 We do not hope to ease our minds (Marnie Barrell) Excellent words of standing with the crucified Christ against injustice. A number of different tunes are offered. I do not have a copy of Alleluia Aotearoa which has two possible tunes. MARY MORISON is the tune in Church Hymnary 4, and it is very straightforward. Emergent Psalter My god, my god (Isaac Everett) A simple refrain, and well-written spoken words for the Psalm itself. Piano music for refrain (click on downloads tab). *STB274 My God my God why why have you forsaken me? (Roberto Feliciano) This can be sung either as a unison refrain, a tricky 4 part harmony chorale, or an even trickier chant with a solost (or reader). The words said by the reader, or sung by the cantor are quite challenging, and coming more from the perspective of poorer nations. This would be pretty amazing to do, and as there are many options, it's quite achievable. The refrain can be sung in English, Bahasa Indonesian, Pilipino, Mandarin or Thamilz. *NCH192 / VU146 / SFFS 2106 / HPP183 / GtG194 / PH312 / Cha199 / 82Hml-715 When Jesus wept (William Billings) I like this simple round. Partly because it's by a Sacred Harp composer - William Billings! It's also very restful and beautiful. I quite like this video sound sample. This might be a good song for the musicians to sing during the offering, or in a prayer of confession. *VU745 / PfAS022F In the presence of your people (Brent Chambers) This is a very well known song in our congregation, but usually sung as a very upbeat, slightly crazy celebration song, but I like the way these books suggest using just the lines "In the presence of your people I will praise your name" as a refrain for a responsively read version of this quite sad, but still hopeful Psalm (for verses 19-31 only, with the refrain sung after vs 22, 24, 28, and 31). I think this could work extremely well. GtG210 / PH168 Lord Why Have You Forsaken Me (Christopher Webber) Simple and honest lyrics. A paraphrase of the psalm to a shape note tune (DISTRESS). Online resource All the ends of the earth (Bruce Harding) A simple Psalm refrain. 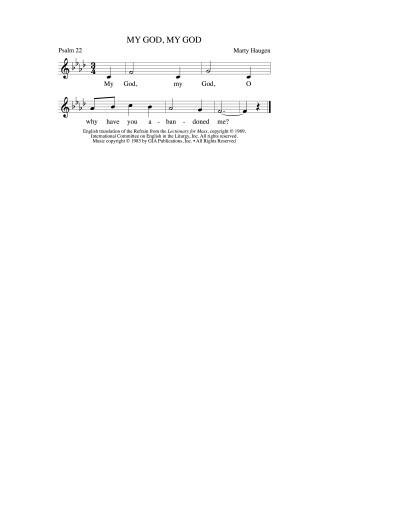 Sample sheet music, and site for purchase. *G(II)28 / GC29 / GC(II)22 / G(3)033 My God My God O why have you abandoned me? (Marty Haugen) Simple chant and good cantor lines. Chant lead sheet. *Online resource Why my God? (Bruce Harding) A lovely haunting round with an optional descant part. Sample sheet music. Purchase here. Stop trampling the poor! Repent! Turn away from evil and towards good! ATW 463 / Iona (T1AU) / ELW721 / SFFS 2219 / A&M835 / GtG750 / GC(II)451 / G(3)528 / W&R296 / URW436 Goodness is stronger than evil (Desmond Tutu) "Victory is ours, victory is ours, through him who loves us". Some congregations change the last line to "Compassion is ours, compassion is ours...". It depends on the context in which you sing it, I suppose. Sound sample. Good for kids. STB268 The grain is ripe (Shirley Murray) Good words about harvest and peace sung to a simple hymnlike tune. Online Resource / Tune In / NCYC'07 Forgive us now (Dave Brown) This is one of the best songs seeking forgiveness that I know. Let’s not forget that sometimes we are the ones waging war against the poor. “Forgive us now, O holy one For crimes committed in your name For all the holy wars we wage For all the children we enslave, Forgive us now O holy one”. Free downloadable songbook, lyrics and sound samples. CH265 / StF527 Pray for a world where every child (Ruth Duck) A good song about praying for things that are difficult to name, including domestic violence. TiS 616 / AHB 547 / NCH611 / UMH730 / VU688 / HPP221 / PH452 / CP092 / CP(E) 33 / Cha700 / 82Hml-600 O day of God draw near / nigh in beauty and in power, come with your timeless judgement now to match our present hour" (Robert Scott) This older hymn has quite excellent words calling for God’s presence, steadfast faith, justice in our land, peace and light. Can be sung to BELLWOODS or ST. MICHAEL. If neither tune is familiar, ST THOMAS (TiS 271) will work well. Lyrics. Oldy-but-a-goody. TiS 689 / ATE 286 / GtB Lord hear my praying, listen to me / Sorrowing song (Robin Mann) Powerful words of lamentation to a simple tune. Words are straightforward about asking difficult questions of God. Lyrics. Good for slightly older kids. A cry for God's clear presence. TiS 599 / AHB 520 / NCH448 / CH502 / UMH399 / VU506 / LBW406 / ELW685 / A&M787 / HPP349 / GtG697 / PH391 / CP435 / CP(E) 581 / W&R466 / Cha609 / Srce633 / 82Hml-707 / Lau874 / StF566 / MP624 / VF133 Take my life and let it be (Frances Havergal) An oldy but a goody. Lyrics and story. Oldy-but-a-goody. Taizé / AoV2-109 / CH772 / GA429 / GtG654 / A&M334 / SFFS 2195 / G(II)396 / GC566 / GC(II)546 / G(3)639 / SP128 / URW381 / Lau944 / W&R448 / StF776 / MP865 In the Lord I'll Be Ever Thankful / El Senyor (Jacques Berthier) A joyful and bouncy short song. Works well in English, German and Spanish at least. Good for kids. Sheet music, translations into many other languages, sound samples. W&R536 Through the Darkness of the Ages (Hilary Jolly) Good words for this Psalm, using the familiar tune ABBOT'S LEIGH. Note that lyrics for Christ includes the term Master which some may find problematic. Lyrics. New words to old tunes. TiS 47 / AHB 46 / AoV1-175 / NCH25 / CH161 / UMH117 / VU806 / LBW504 / ELW806 / GA459 / A&M746 / HPP1 / GtG687 / PH210 / GC614 / GC(II)588 / G(3)688 / CP528 / CP(E) 537 / W&R84 / Cha067 / Srce2-441 / URW200 / 82Hml-680 / PfAS090B / Lau955 / StF132 / MP498 O God our help in ages past (Isaac Watts) A good solid very well known hymn! The surprising thing about this one is that the language is inclusive for God in most sources. Not all sources are inclusive for humanity, so check. Lyrics and sound sample. Oldy-but-a-goody. CH247 / VU394 / G(II)491 / GC685 Moved by the Gospel Let Us Move (Ruth Duck) Excellent words about going out into the world to weave, and paint, and mime, and dance, and play music in the midst of all of life's craziness. Sung to the familiar tune ELLACOMBE. This fits well with the verse "O prosper the work of our hands!" Lyrics. New words to old tunes. *NCH Psalter (at the back of the NCH hymnal) From everlasting to everlasting you are God (Elaine Kirkland) A really nice refrain for a read or chanted Psalm. Good for kids. PfAS090C Teach us to know the shortness of our days (Hal Hopson) A good, gentle Psalm refrain. "May wisdom dwell within our hearts"
PfAS090D Wildflowers bloom and fade (Ruth Duck) Good and hopeful words, mixed in with some quite hard ones; sung to a Celtic style hymn tune. Each verse ends with the phrase "O God, our home". 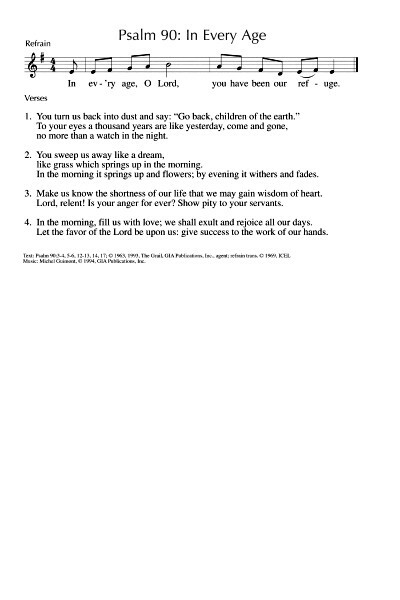 *Online Resource Our Song in the Night (Bruce Harding) A good responsorial Psalm. The refrain will need to be taught. You could also play the recording, but I think it would be better to make use of your own musicians (well, that's always my preference, but not everyone has musicians). Sound sample, lyrics, purchasing options. AoVNG77 In Every Age O God you have been our refuge (Janet Sullivan Whitaker) A really lovely song, and quite easy to sing. The verses are a little complicated, so you could just invite the congregation to join in the chorus. Lyrics and sound sample. G(II)77 / GC83 In every age, O God, you have been our refuge (Michael Guimont) A nice simple refrain and good translation of the verses. Lyrics and sheet music sample. Sound sample. CH054 Lord you have always been our home (Church Hymnary) Good words. I like the tune ATHCHUINGE for this. TiS 613 / AHB 546 / ATOK 405 / CH166 / LBW469 / ELW765 / A&M713 / SFFS2197 / HPP265 / GtG683 / GC578 / GC(II)560 / G(3)663 / CP506 / CP(E) 507 / W&R469 / URW179 / 82Hml-482 / Lau969 / StF526 / MP882 Lord of all hopefulness Lord of all joy (Joyce Torrens aka Jan Struther) Excellent straightforward Irish tune (SLANE), and beautiful words. Would be a good choice for the final song. Oldy-but-a-goody. TiS 387 / CH416 / UMH318 / VU158 / LBW363 / ELW389 / A&M199 / GtG246 / PH108 / CP(E) 140 / W&R312 / 82Hml-182 / Lau272 / StF297 Christ is alive Let Christians sing (Brian Wren) Excellent words of Christ's saving, and still relevant grace. A couple of tunes are offered in different hymn books. I prefer TRURO. Lyrics and sheet music. New words to old tunes. ATW 459 I don't believe in a God up in the sky / God Version 1.0 (Robin Mann) An excellent rock song about how we think about God, or not! Lyrics and mp3. Good for kids. Online Resource / Worldmaking.net O Christ, Lamb of God (Richard Bruxvoort-Colligan) A more modern Agnus Dei, "Christ sharing our weakness". Lyrics and sound sample. TiS 590 / AHB 165 / AoVK-117 / NCH506 / UMH526 / VU663 / LBW439 / ELW742 / HPP408 / GtG465 / PH403 / CP532 / W&R473 / Cha585 / Srce 776 / StF531 / MP746 What a Friend we have in Jesus (Joseph Scriven) There is a bit of masculine language, but the song has so many other good things about it. I like both tunes. AOVK has different lyrics, written specifically for kids, which I think are worth singing. Good for kids. Oldy-but-a-goody. TiS 272 / AHB 200 / NCH122 / CH472 / UMH196 / VU002 / LBW030 / ELW254 / A&M030 / HPP89 / PH001/002 / GtG082/083 / GC323 / GC(II)345 / G(3)403 / CP088 / CP(E) 24 / W&R153 / Cha125 / URW101 / 82Hml-066 / Lau100 / StF169 / MP102 Come Thou Long-Expected Jesus (Charles Wesley) Most versions of this old hymn are quite inclusive, although still quite old fashioned. 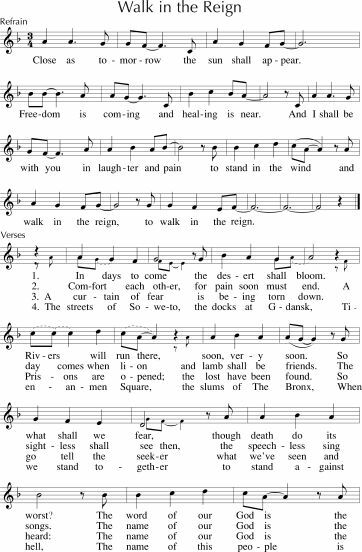 The New Century Hymnal replaces the kingly language in verses 3 and 4 with something less (um….) kingly. You may be interested in this rewrite, which focuses on Jesus coming to save creation. Oldy-but-a-goody. Online Resource Through you all things are possible (Bruce Harding) A simple, reflective chant available to purchase online. Sample sheet music, mp3 and ordering. TiS 599 / AHB 520 / NCH448 / CH502 / UMH399 / VU506 / LBW406 / ELW685 / A&M787 / HPP349 / GtG697 / PH391 / CP435 / CP(E) 581 / W&R466 / Cha609 / Srce633 / 82Hml-707 / Lau874 / StF566 / MP624 Take my life and let it be (Frances Havergal) An oldy but a goody. Lyrics and story. Oldy-but-a-goody. NCH562 / AA127 / Cha381 Take my gifts and let me love you (Shirley Murray) Good words about giving God ourselves, our goods, our money. Can be sung either to the set tune by Colin Gibson (TALAVERA TERRACE) which is quite straightforward, or the more well known tune HOLY MANNA. New words to old tunes Lyrics. Online Resource / Tune In: Hail the fisherfolk (Dave Brown) A bluesy litany of the saints, including the fishermen of yesterday and the fisherfolk of today. Free downloadable songbook, lyrics and sound samples. NCYC ’93 / ATFG586 We will love / We will walk with you at the edges (Graeme Gardener) This is a good little rock number “We will walk with you at the edges, we will die with you at the cross roads, we will risk with you taking chances, we will love”. Or something like that. Good for older kids. ATOK 413 / Iona (HSNW) / CH533 / VU567 / StS039 / A&M510 / ELW798 / GA502 / SFFS 2130 / HPP317 / GtG726 / G(II)510 / GC700 / GC(II)687 / G(3)790 / CP430 / CP(E) 622 / W&R350 / URW060 / Lau877 / StF673 Will you come and follow me / The Summons (John Bell) A classic. Don't sing it too slowly or it really drags and takes forever! Recorded music Give it away now (Red Hot Chili Peppers) I think it would be pretty fun to play part of this (some of the lyrics are not so appropriate for congregational use). I like the idea of "sampling" music creatively during worship. Lyrics and something of the story behind the song. G(II)249 / GC319 / GC(II)325 Close as tomorrow the sun shall appear / Walk in the Reign (Rory Cooney). I really like this one. “Close as tomorrow the sun shall appear. Freedom is coming and healing is near. And I shall be with you in laughter and pain to stand in the wind and walk in the reign”. Nice little lyrics twist there! The 4th verse mentions specific locations (Soweto, Gdansk, Tiannenmen Square, The Bronx), which you could retain or change, as you feel appropriate. This sound sample gives it a bit of a gospel feel. Sheet music and lyrics.